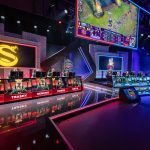 The playoffs for the League of Legends Spring Split are happening all weekend long, as teams face off in a battle for Championship points and eventually a place the World Championships in September. 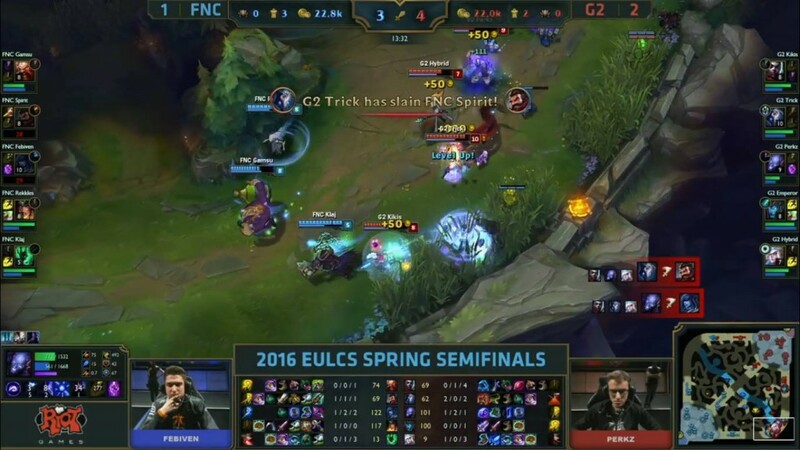 It’s European juggernaut Fnatic against the top team from the regular season G2 Esports in this first semifinal match. I’m Joe, and I have the pleasure of providing you minute by minute coverage of today’s mouth watering matchup. 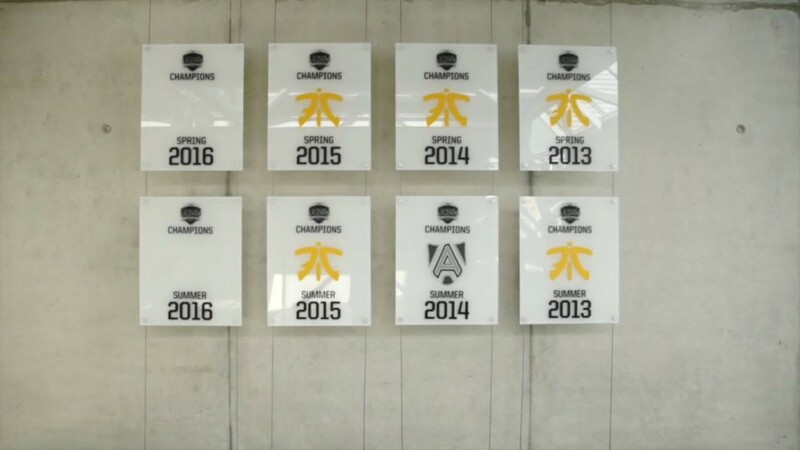 Will Fnatic be able to defend their Championship? 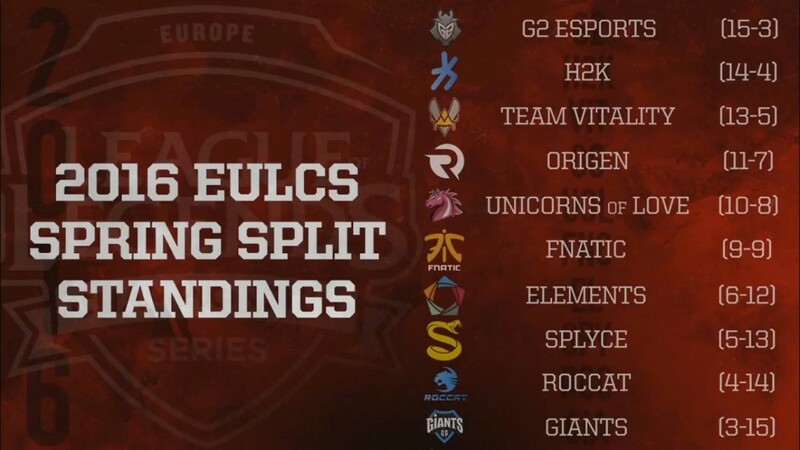 This is how the teams compared during the Spring Split season. 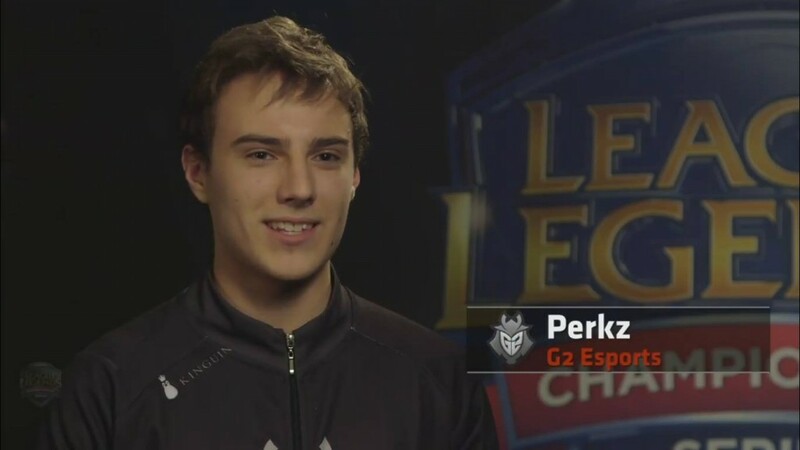 Perkz looking forward to facing his friends on Fnatic. 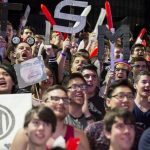 Perkz has the most DMG per min amongst mid laners in the LCS. Most kills, lowest average win time, best Gold Diff @ 15mins. G2 have been dominant this year. 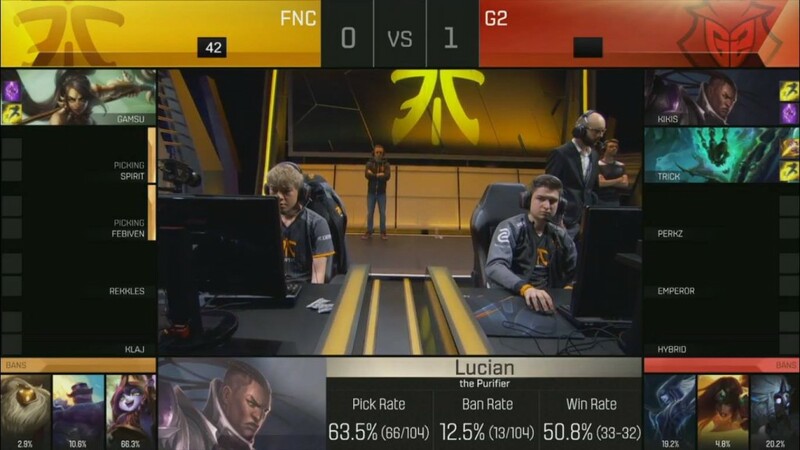 Game 1 pick and bans complete. We’re underway! 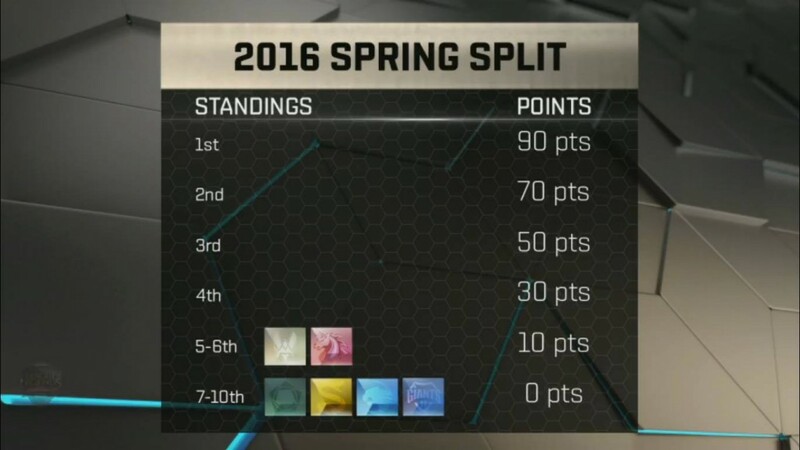 Who will take the final spot in the Spring Split final? 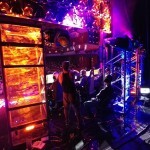 Standard lane swaps in Game One, both teams trade turrets. Perkz goes low after a roam by Klaj helps Febiven in the mid lane. 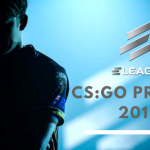 Fan vote goes in favour of Fnatic. 10 minute update. G2 started to press bottom turret and dragon. G2 grab the first Dragon of the game. A lot of macro focus going on here. No fights at all yet. 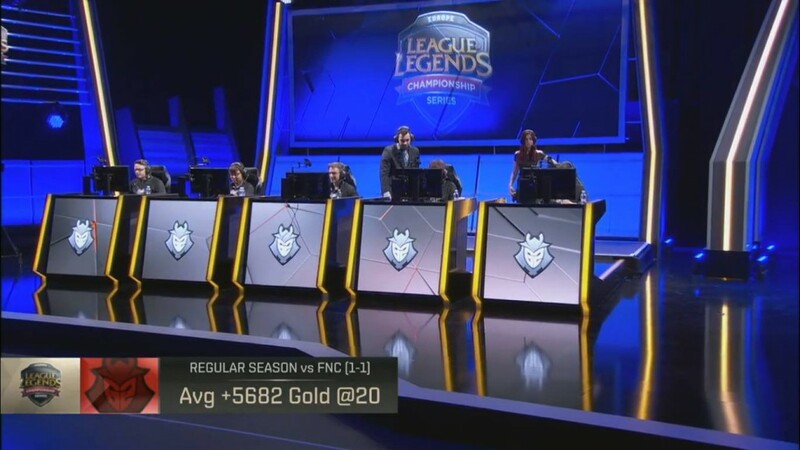 FNC have a slight gold lead. G2 catch out Gamsu top lane. 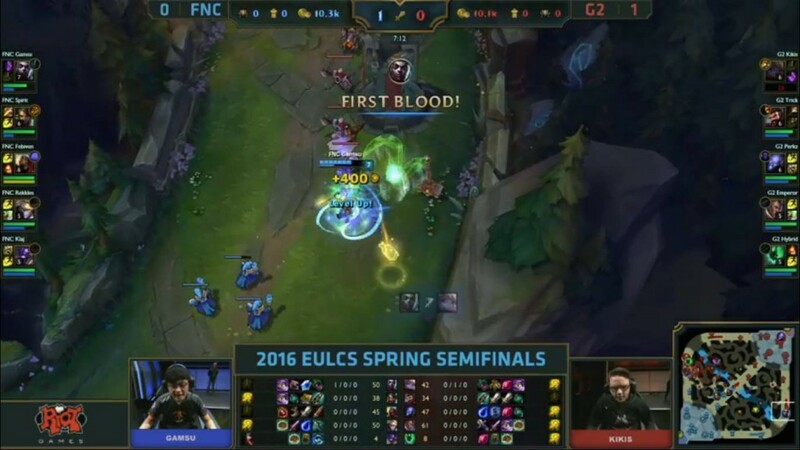 First blood for Kikis. 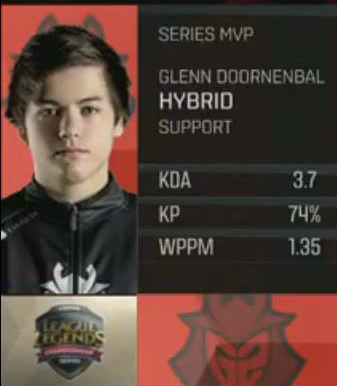 G2 slay the Dragon. 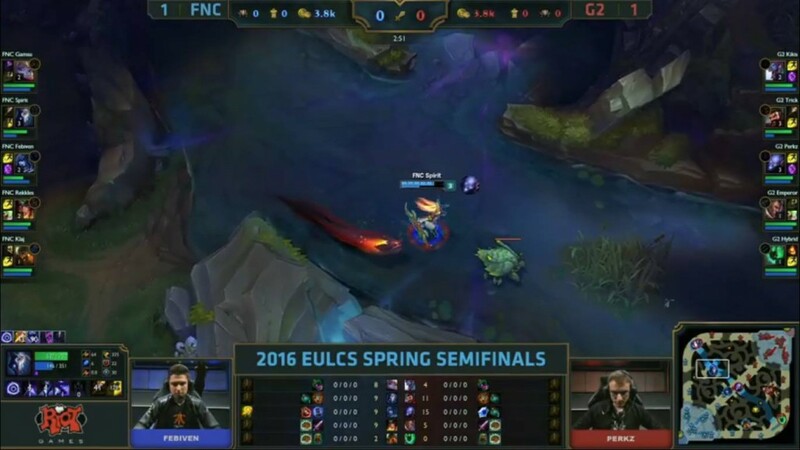 Game’s going very slow, will favour FNC and their Kassadin. 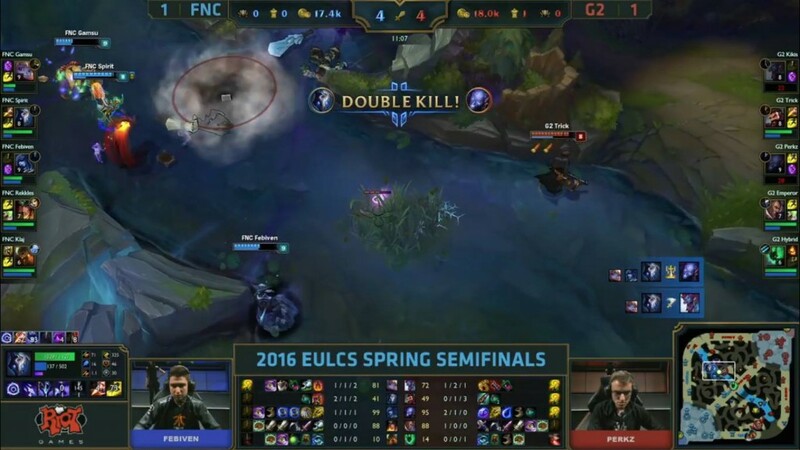 Rekkles and Febiven farming very well for FNC. The first team fight in this will be huge. G2 take Dragon and mid tower. 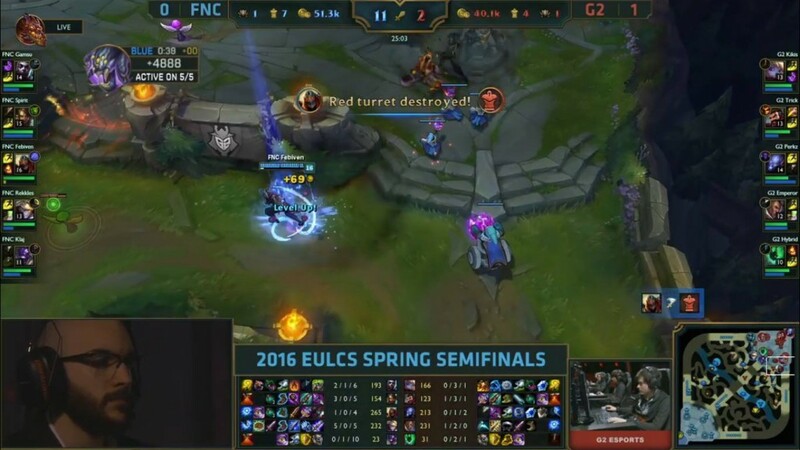 FNC get bottom 2nd tier turret. 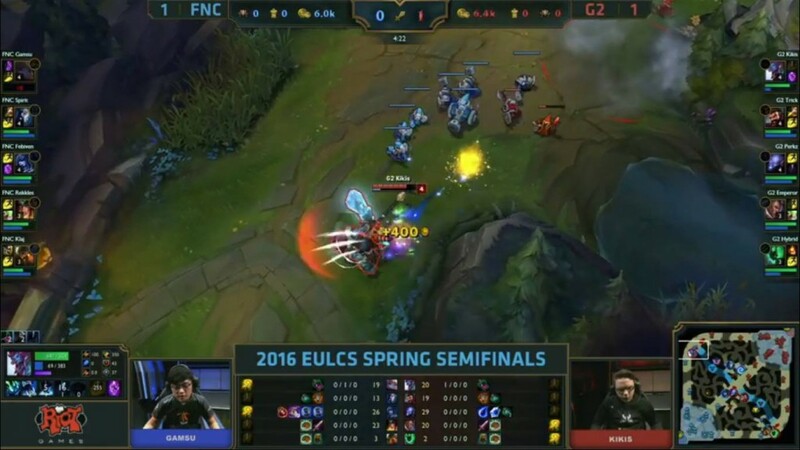 G2 close in on mid turret – FNC react and try to pick off Emperor but quick reactions from the ADC sees him evade it. G2 take that fight 2-1. Closing in on 30mins here. Here is the stats so far. 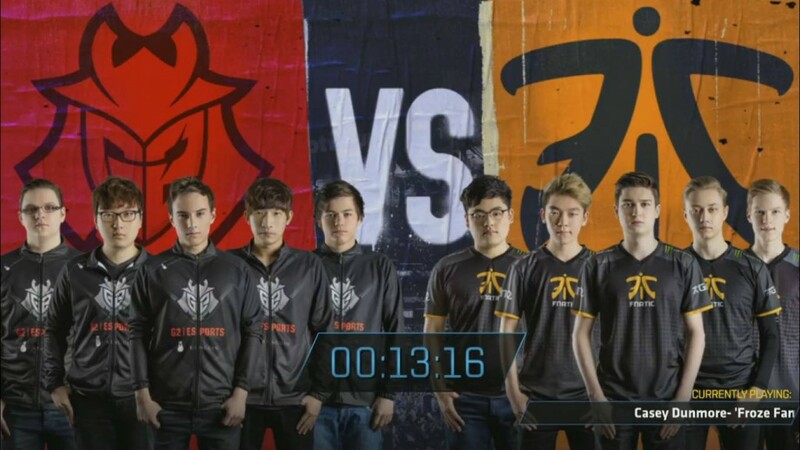 G2 looking to fight, maybe they’ll fight them around the next dragon which is up in a minute. 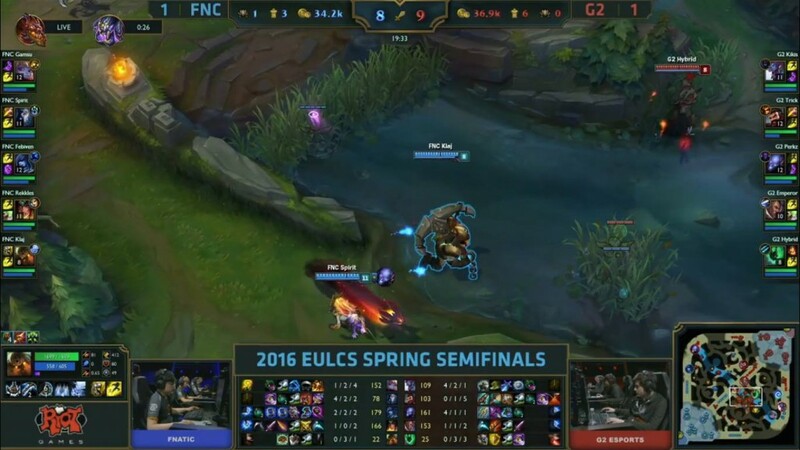 FNC lose their bot tower and decide to fight. TP’s are matched and it’s a 5v5. G2 win 4-2 and push on to grab the win! 1-0 G2. 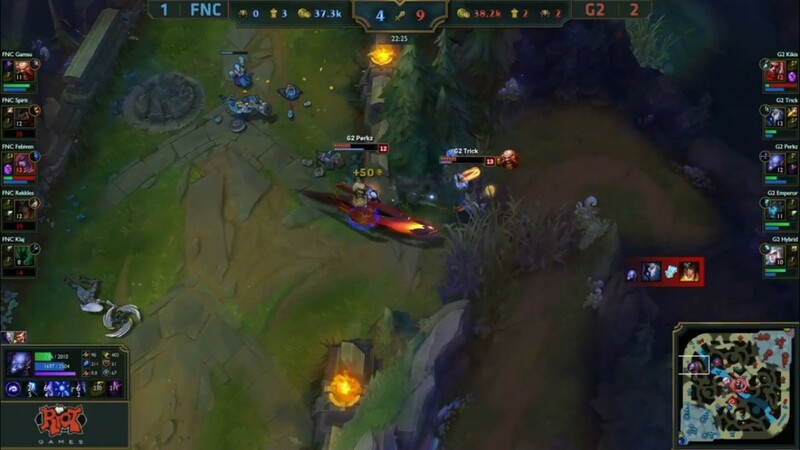 The damage dealt to champions in that last fight that saw G2 push for the win. 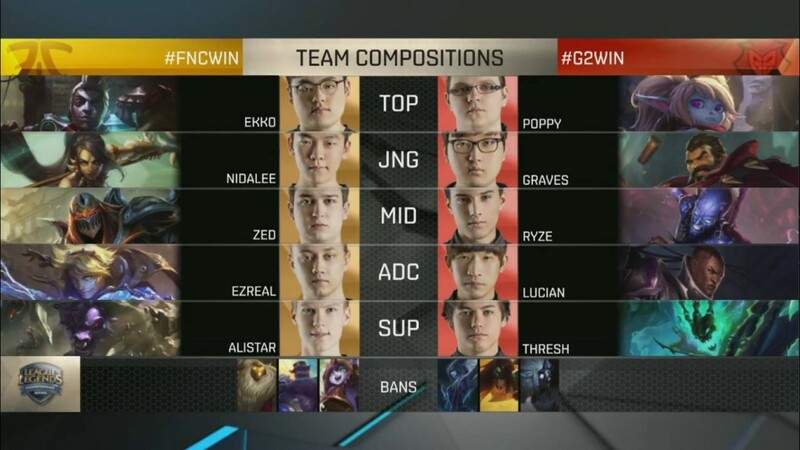 Picks and bans are underway for Game 2…will update you when they are done! Thing to notice is that Liss has been banned. We’re underway in Game 2. 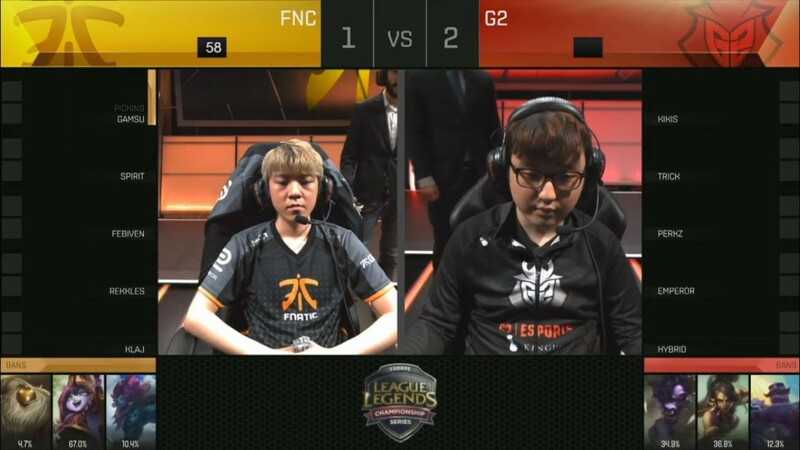 Can FNC pull it back to tie the series? Early flash by Kikis. 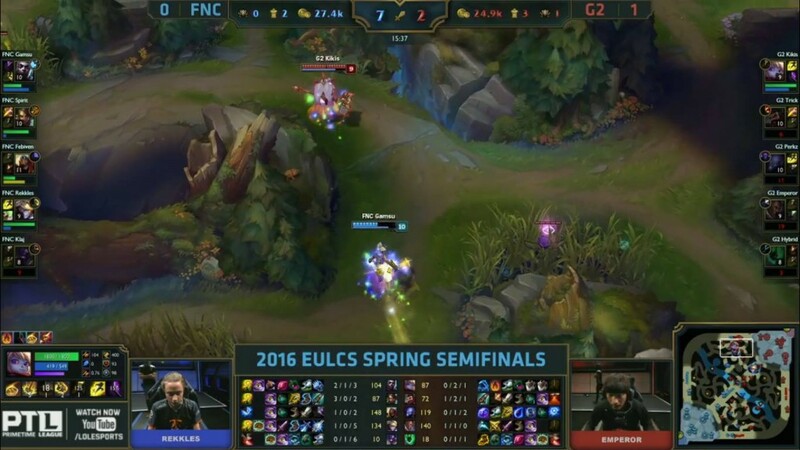 Ekko into Poppy is a great match up for Gamsu, Kikis will need help down bot. 5 minute update as Hybrid hooks the Alistar to deal some damage. 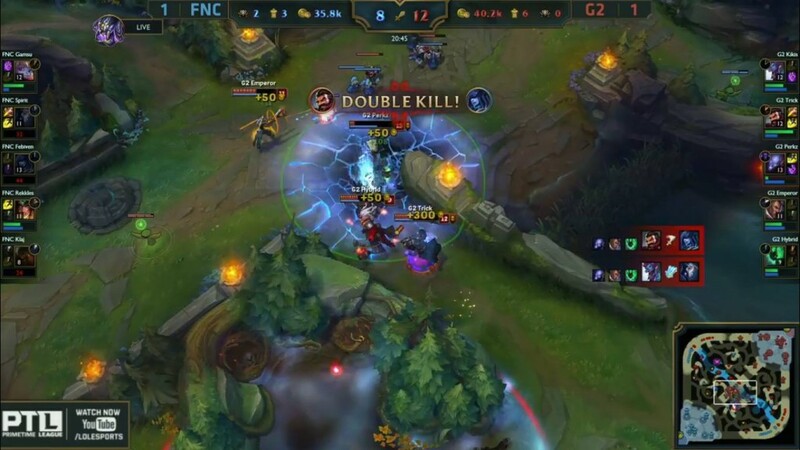 Huge damage from Perkz onto Febiven who just survives. 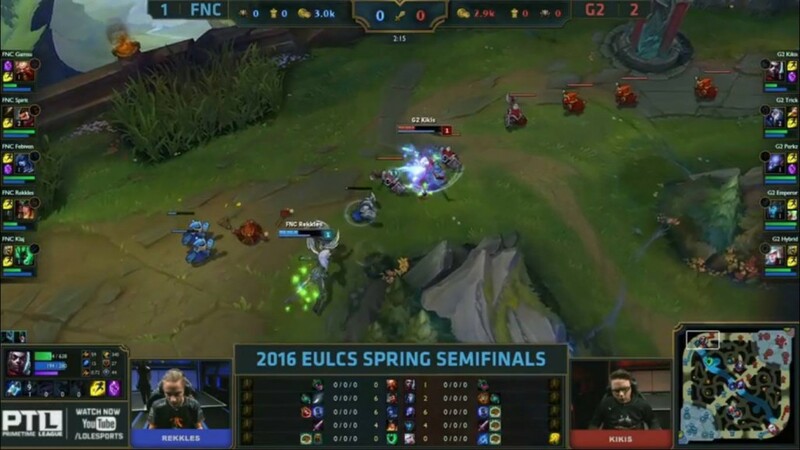 Kikis tries to 1v1 Gamsu and it just wont work, Ekko has the advantage in that matchup. 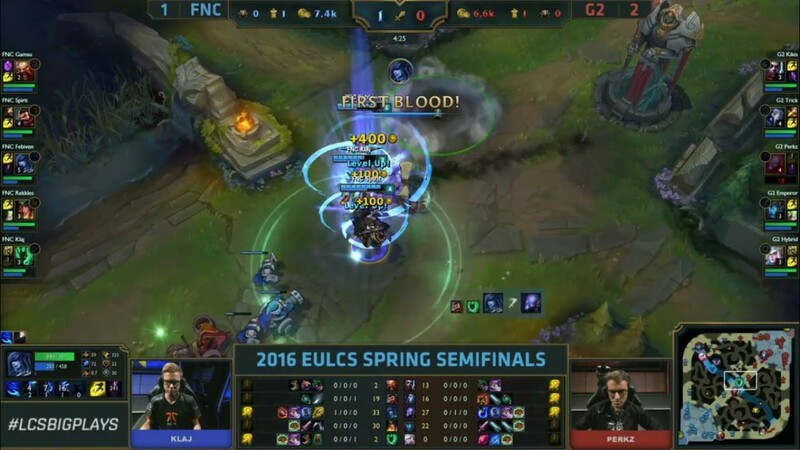 First blood goes to FNC. 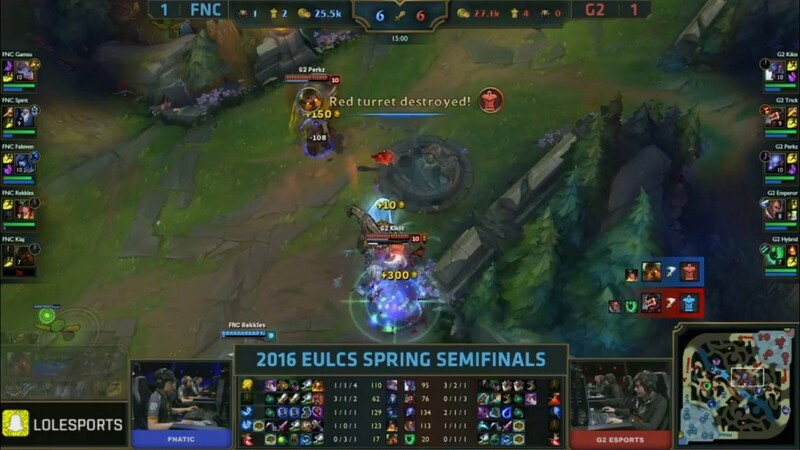 FNC take down Kikis and Trick in the top lane, getting the turret afterwards too. 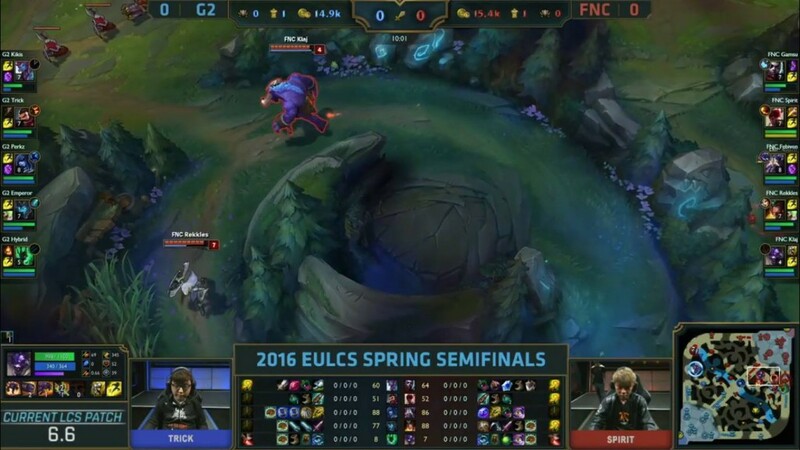 G2 respond by getting bottom lane turret, but this is a good start by FNC. G2 grab the first Dragon. 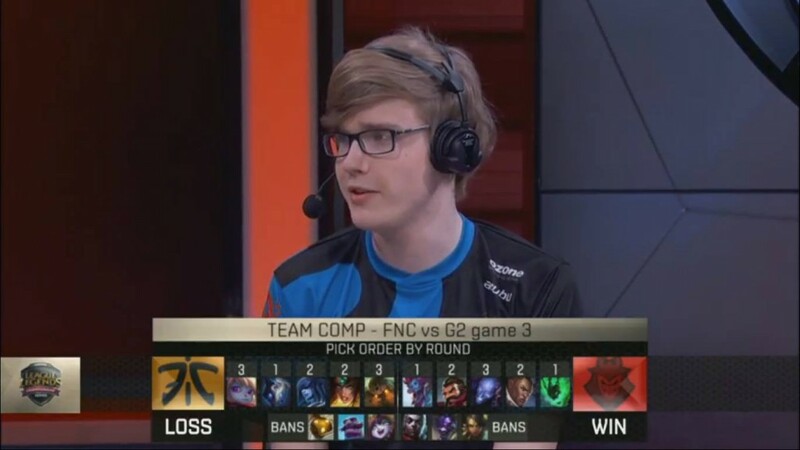 It’s been rough for them and especially Kikis though, that Poppy pick not proving to be a good one – they could have gone with a Trundle that somehow managed to find it’s way through the pick and ban phase. 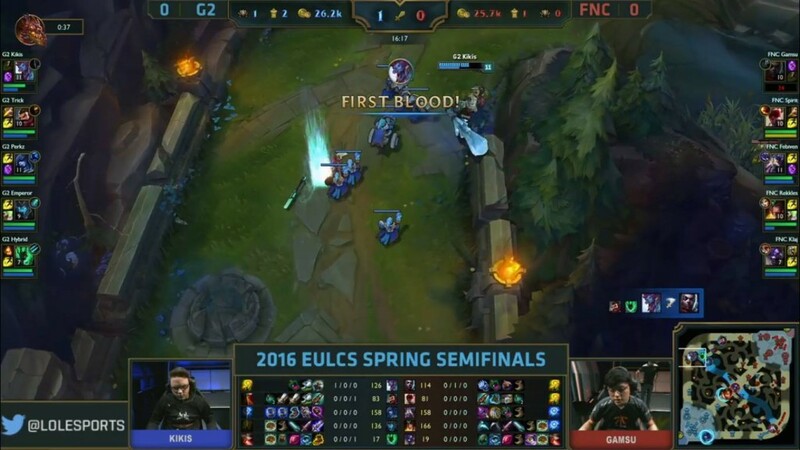 Perkz and G2 pick off Gamsu in the bot lane. 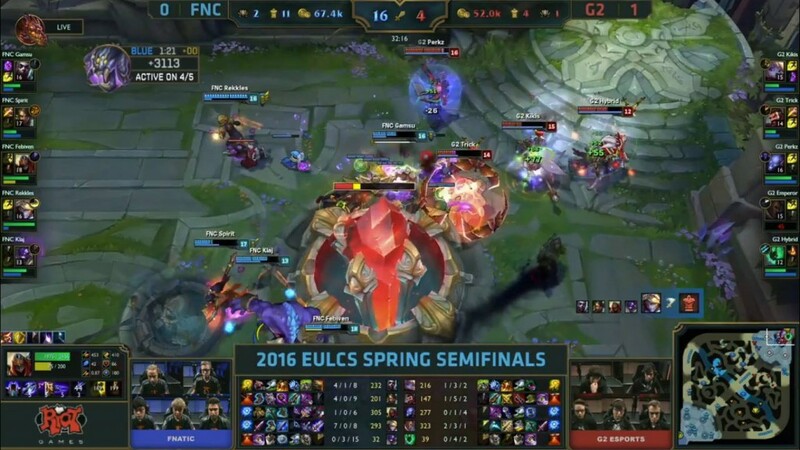 FNC engage on G2 as it’s a 4v5. 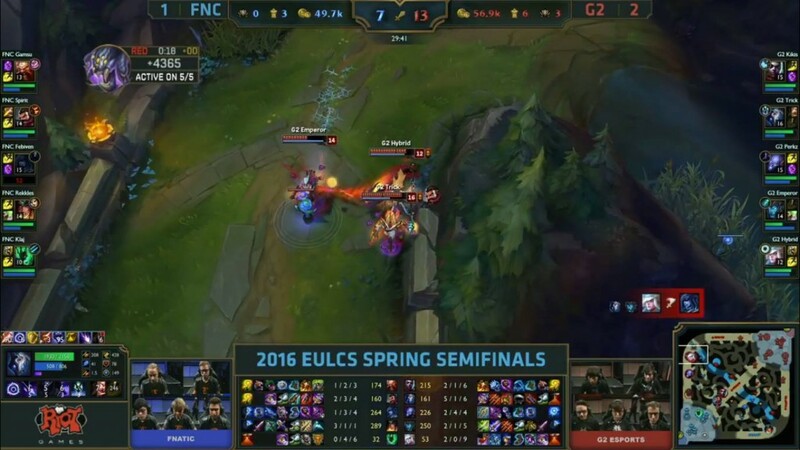 Perkz isn’t really able to do anything in that fight – getting jumped on straight away. 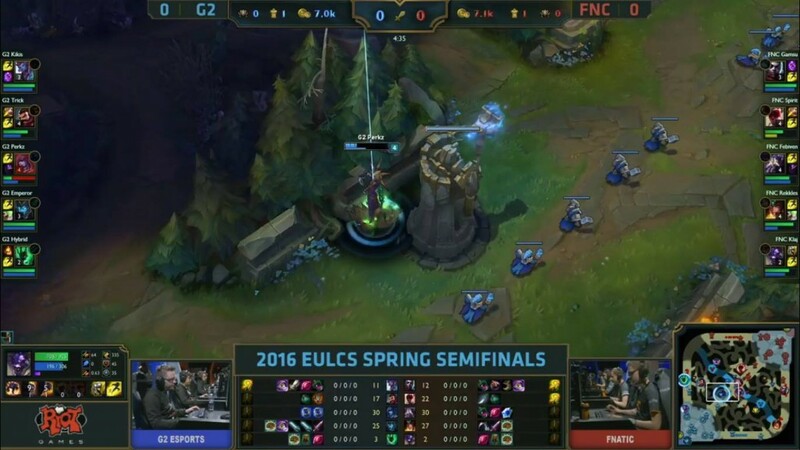 FNC push to take the mid turret. 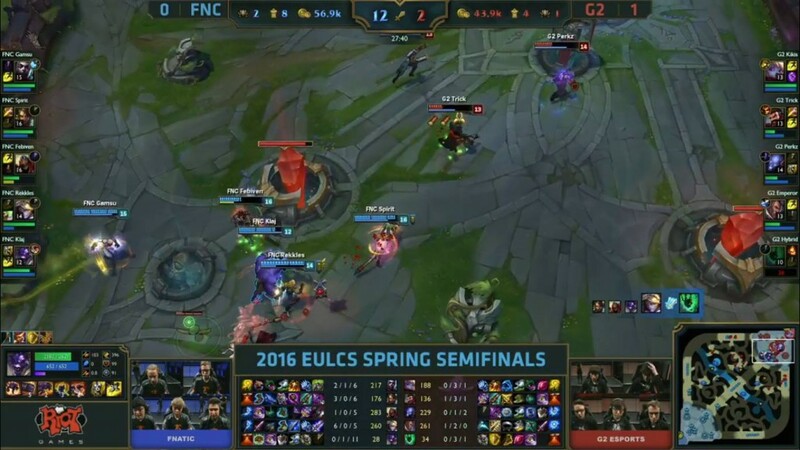 This 1 – 3 – 1 comp working brilliantly for FNC. 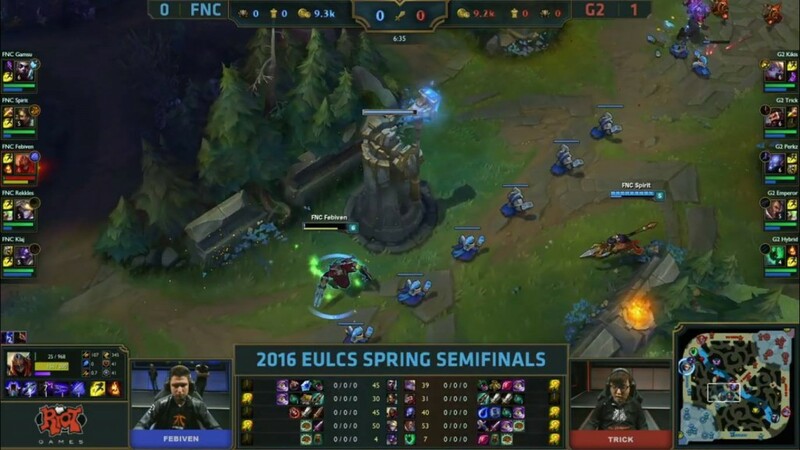 Zed and Ekko are very good solo laners and they’re putting pressure over the map now. 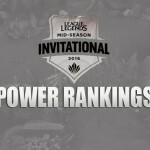 Febiven about 50 CS up on Perkz’s Ryze. 20 minute update as Baron spawns. 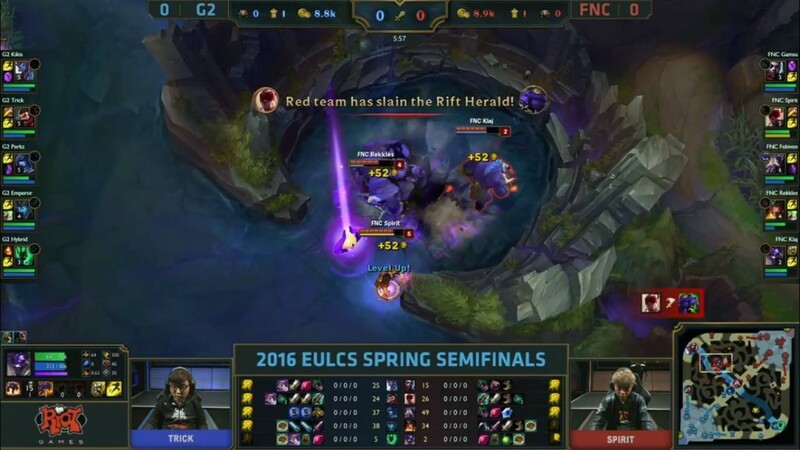 A huge team fight ensues in G2’s red side jungle. 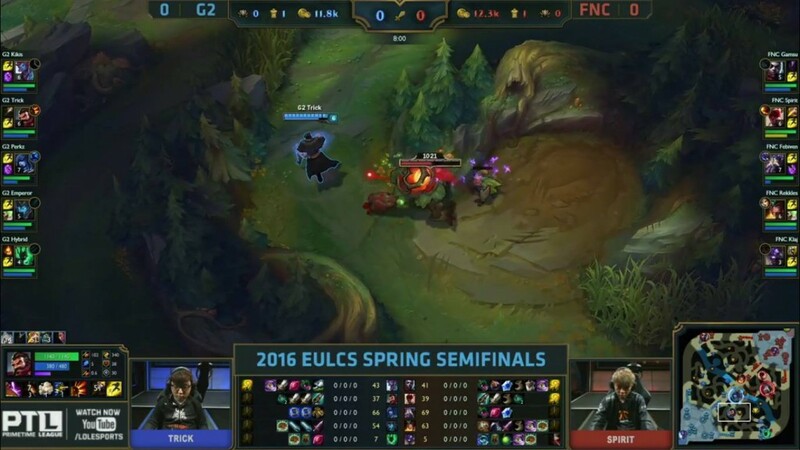 Febiven takes Perkz low in the solo lane, and the rest of his team collapse on Trick whose found in his own jungle. 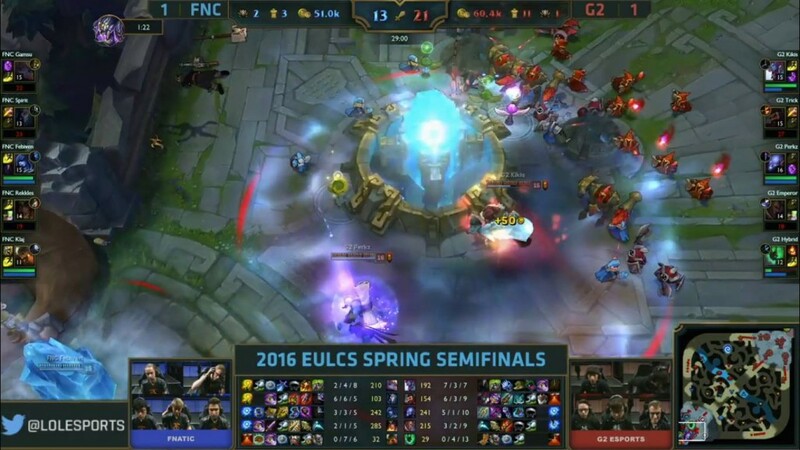 FNC take that one-sided fight 3-0. They secure Baron. 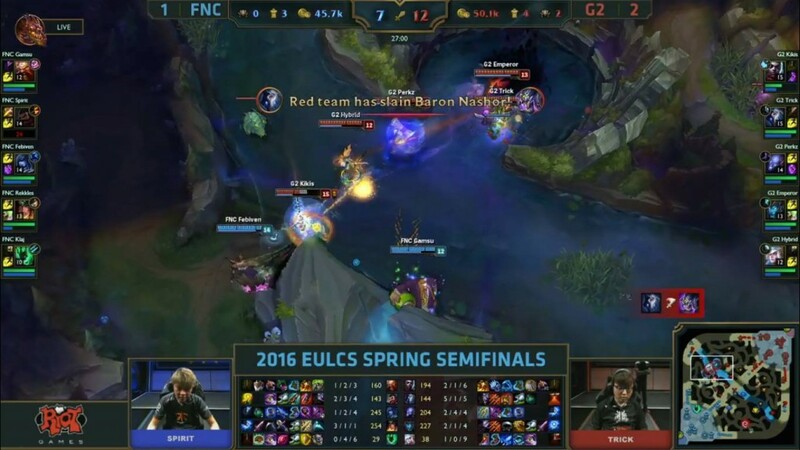 FNC closing in on a win here, 11K gold in head – that Baron play has giving them 4888 gold so far. 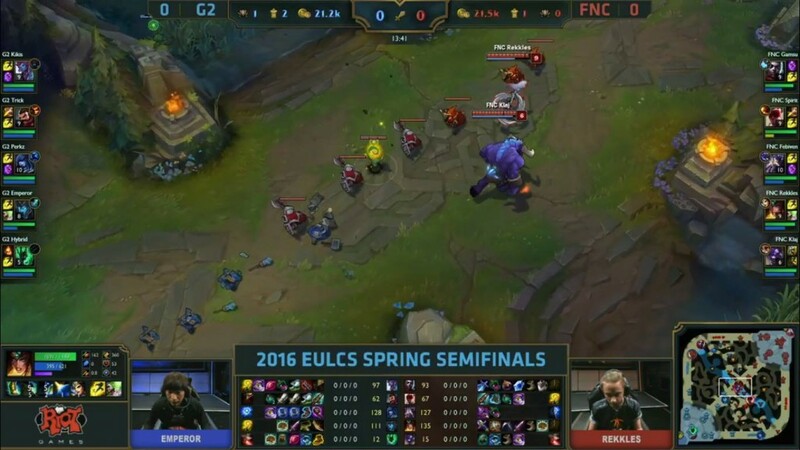 Perkz flashing forward to try and get kill means FNC move in for the team fight. 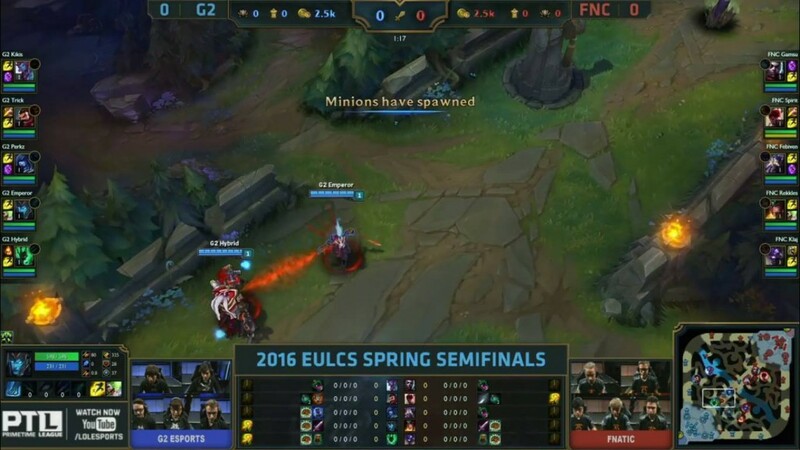 They push G2 into their base and take 2 inhibs. They recall and will be looking to end. 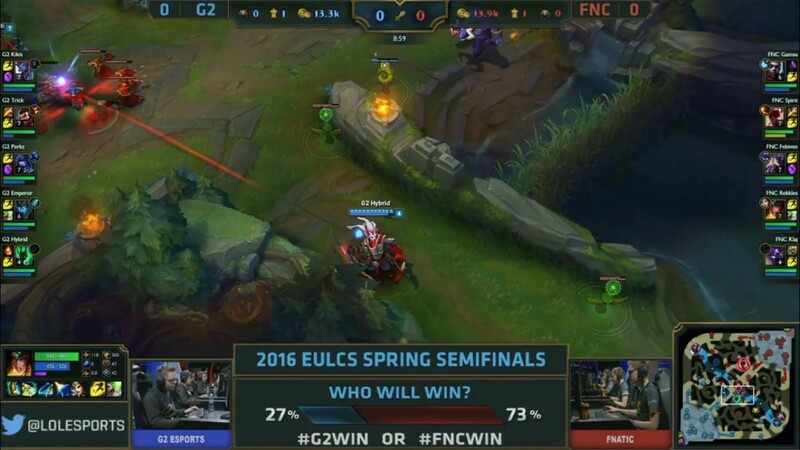 G2 have to try and stop FNC doing Baron. 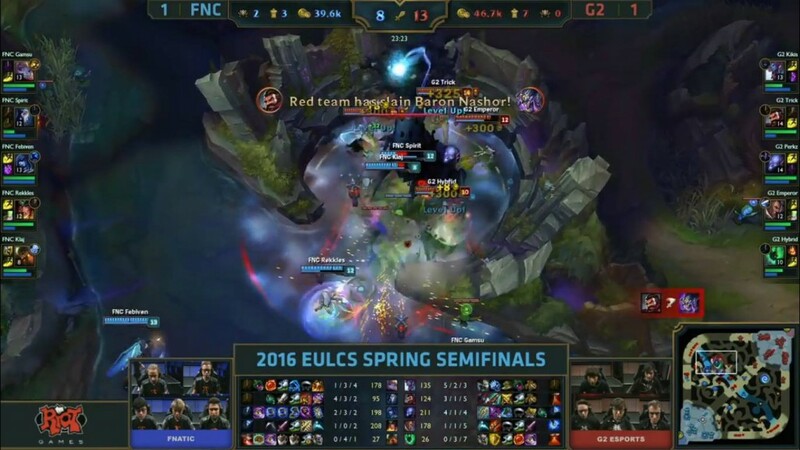 They delay it for a minute or so but FNC take out Trick and Hybrid to secure Baron. Game’s gonna be over now. 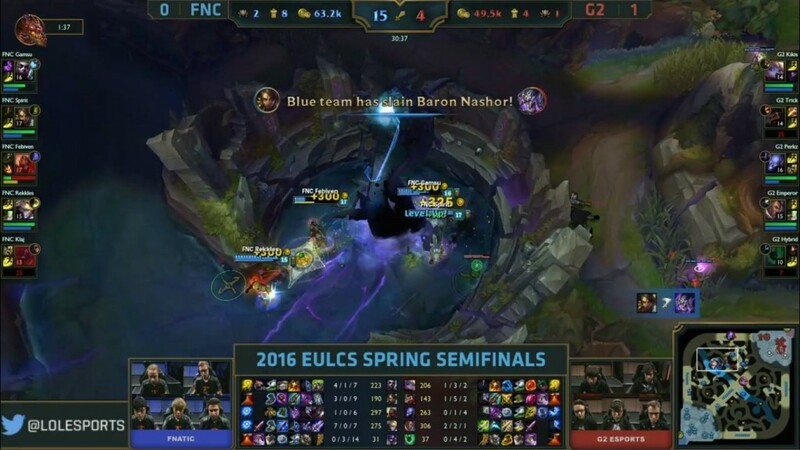 FNC use their Baron bush to push in to win. 1-1 in the Series, Game 3 coming soon. 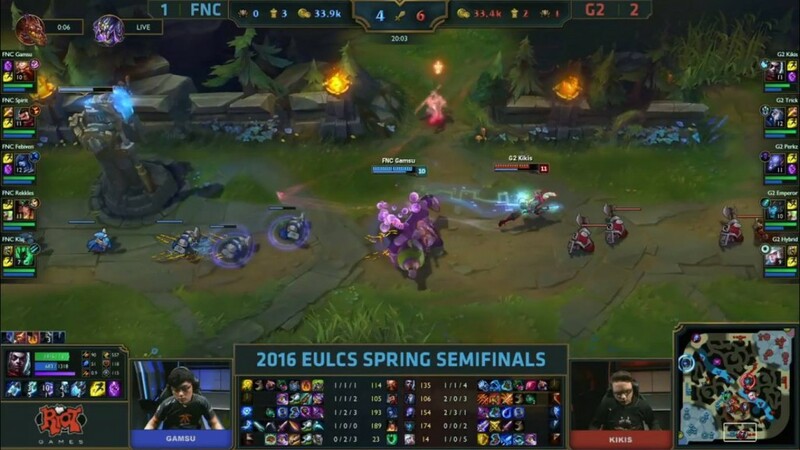 G2 need to find away to deal with this Ekko. 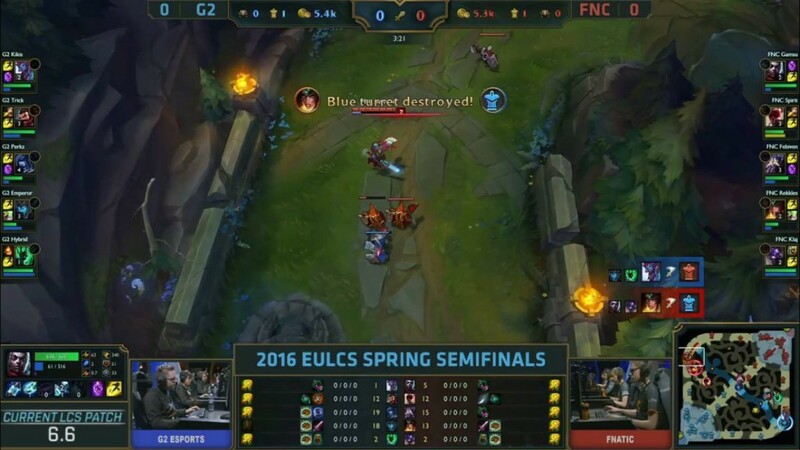 They either need to ban it, as FNC are blue side and have first pick, or take Trundle to try and deal with it. Not Poppy. 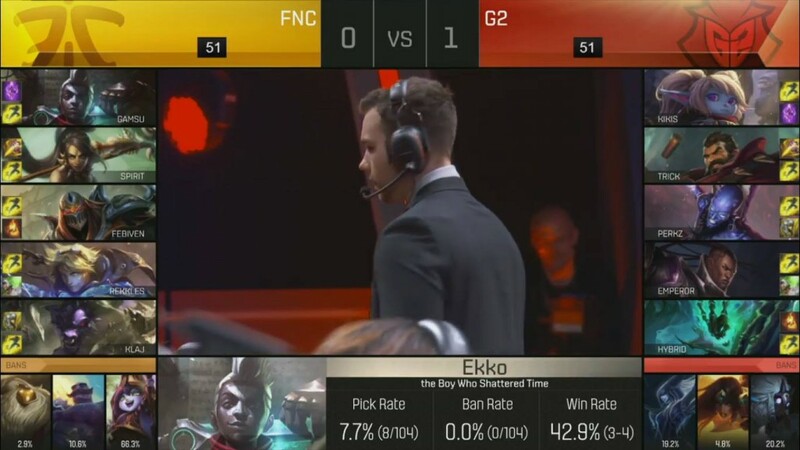 G2 ban away that Ekko that was such a nuisance last game. Game 3 underway! Flashes blown early game. 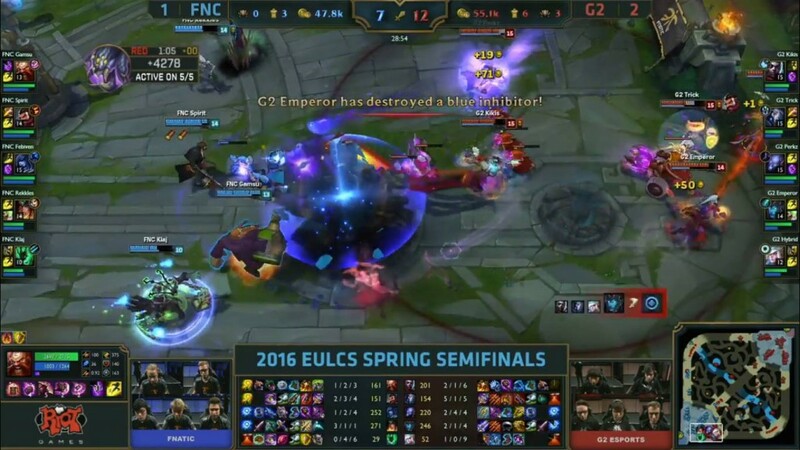 On G2, Trick burns his flash, and Emperor burns his. 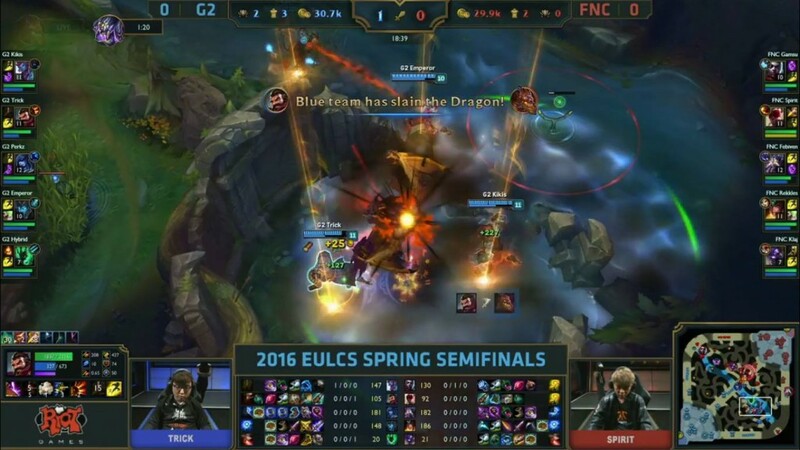 For FNC, the support, Gamsu and Spirit burn theirs. 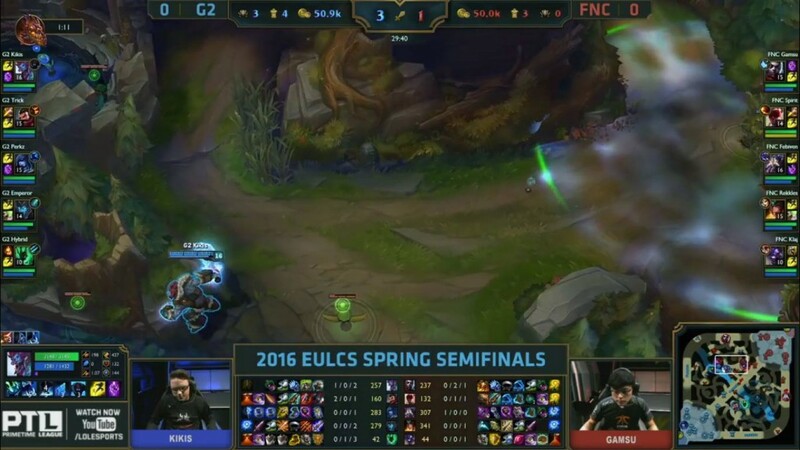 Gamsu, who is without his flash, goes down to Kikis in the top lane. First blood for the Trundle. A fight breaks out mid lane. 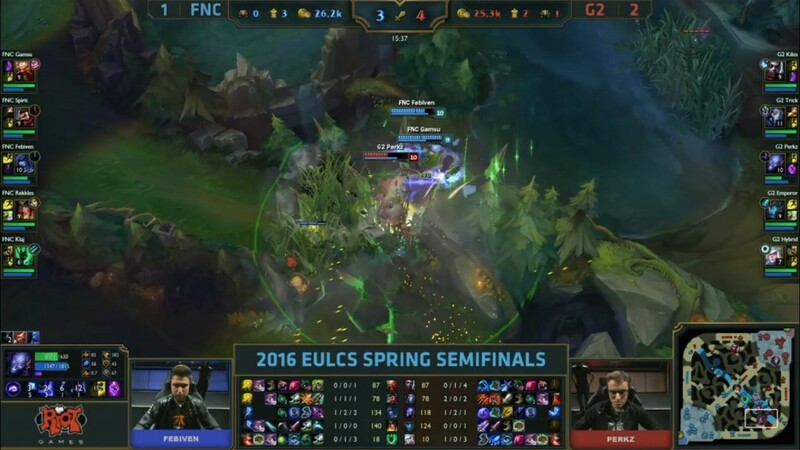 Febiven takes down Trick and the fight looks to be in FNC’s favour, but Perkz’s Ryze damage is huge. 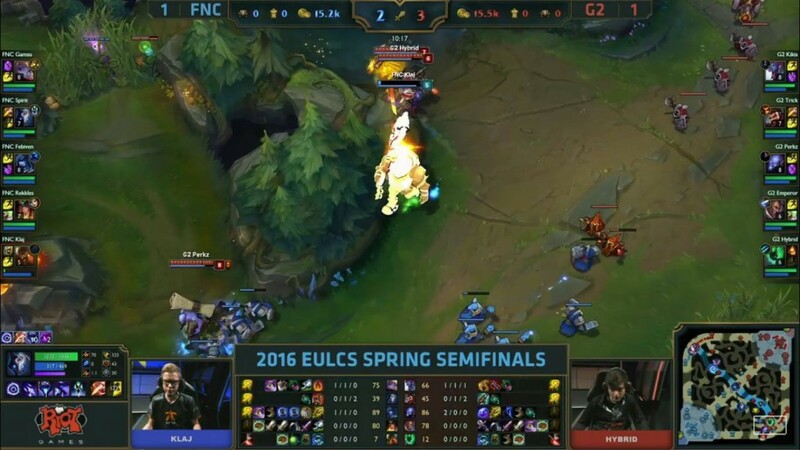 He takes down Spirit and then a teleport by Kikis helps him take down Febiven. 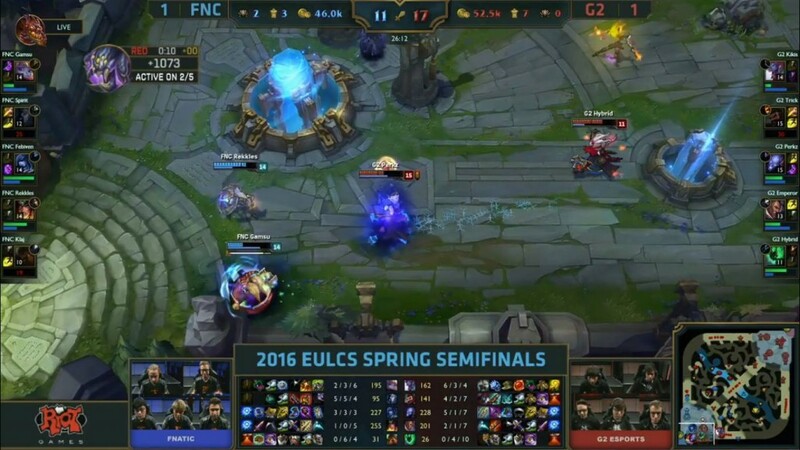 2-1 for FNC. Kikis goes down to Gamsu. 3-2 in kills now for G2. Klaj out of position in the bot lane. G2 pick him off. G2 think they’ve caught out Spirit but his team collapses for him and they get 2 kills. 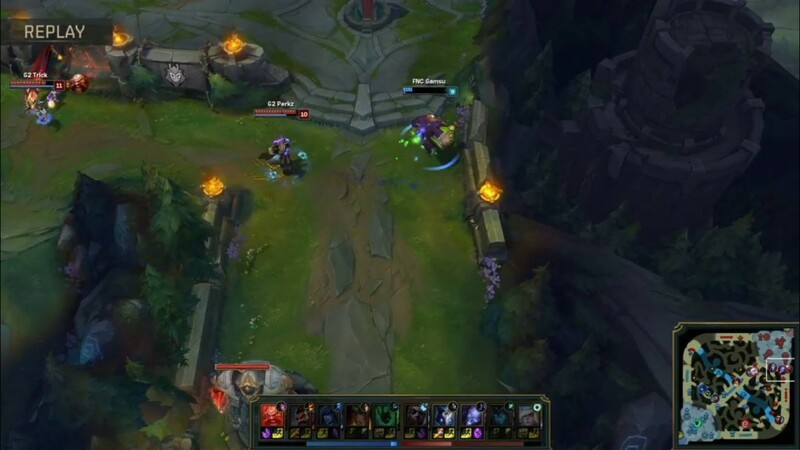 Gamsu’s teleport to bot lane cuts off 2 members of G2 who are in retreat. They pick up 2 kills. FNC level in gold now. 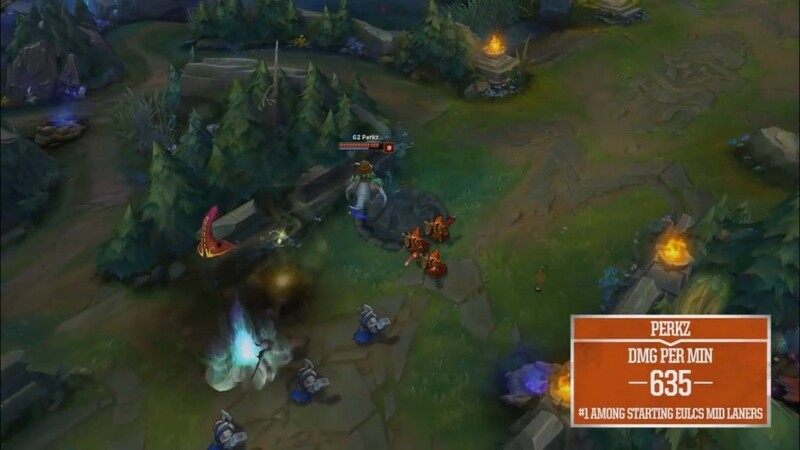 G2 catch out Klaj, again, and push down mid – they take down one turret and push for the next. 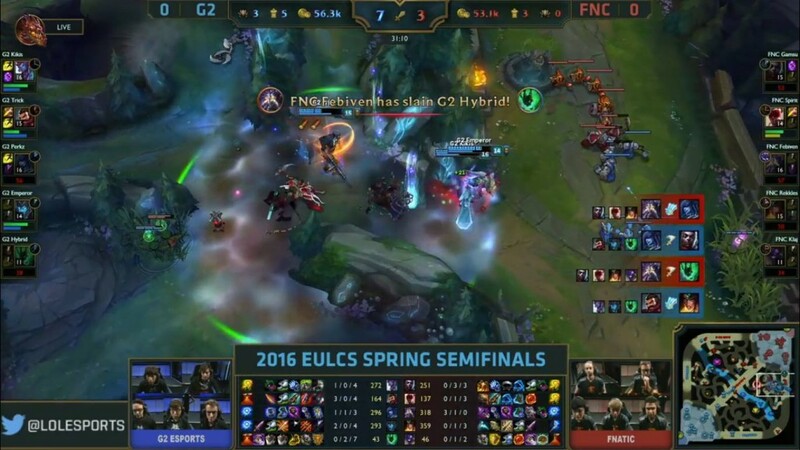 A good ult by Febiven catches out multiple members and manages to take down Hybrid. G2 retreat. 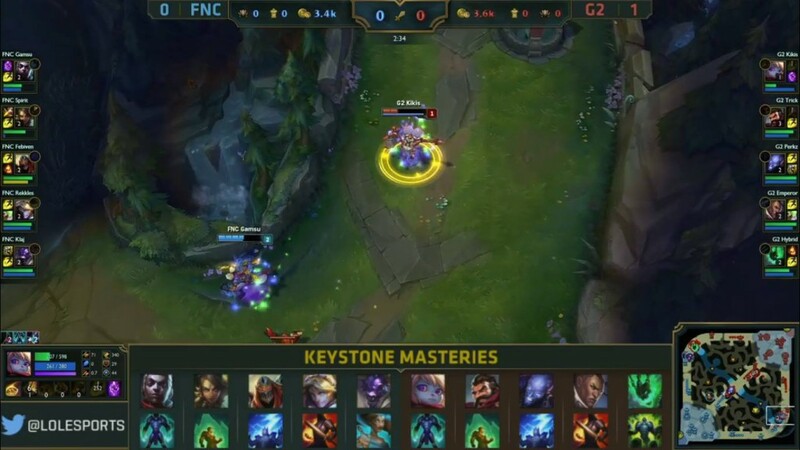 FNC think they’ve caught out Perkz, but Spirit misplays – he ults and keeps the Ryze a head for just a bit longer – he kites backwards and is still able to land abilities in this fight. 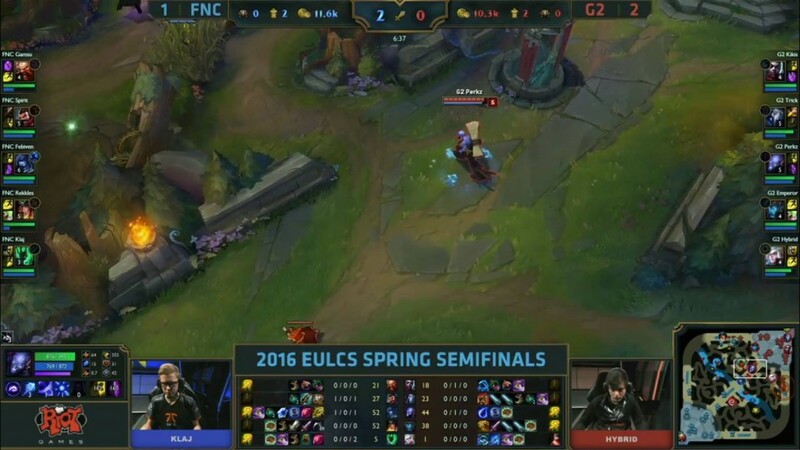 Febiven tries to take him out at the end and he can’t – G2 take the fight and push on for an inhib. 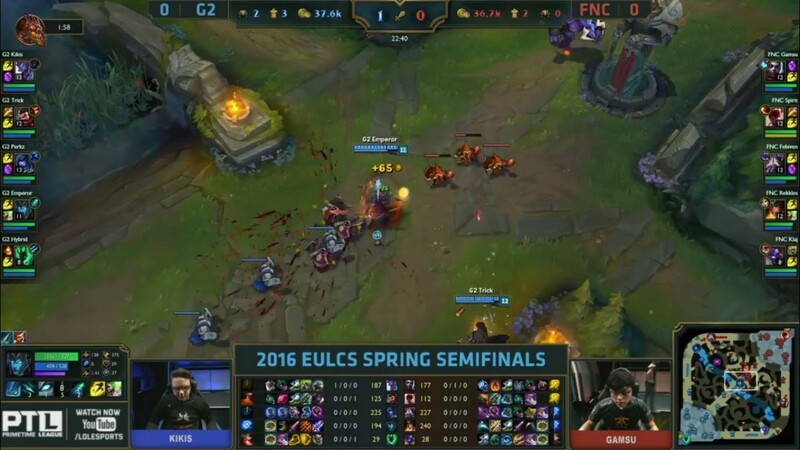 G2 take the Baron – FNC manage to pick up 2 kills as G2 retreats. Perkz is a monster on this Ryze. 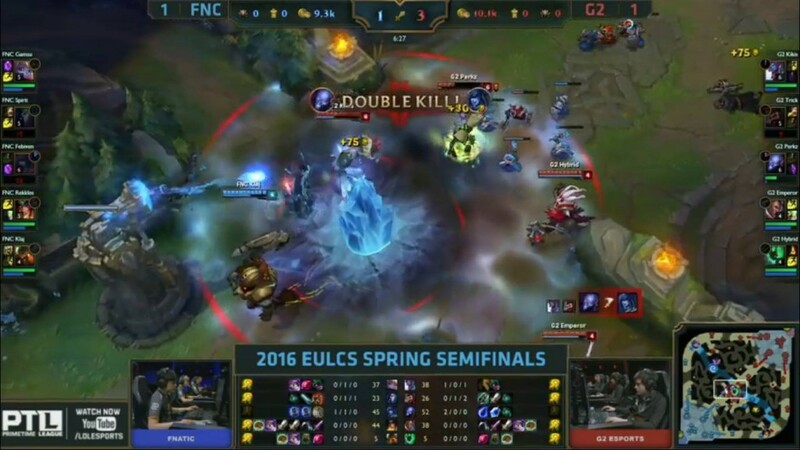 G2 fight FNC outside the enemies bottom turret, they win 2-1 and push in to take the inhib. 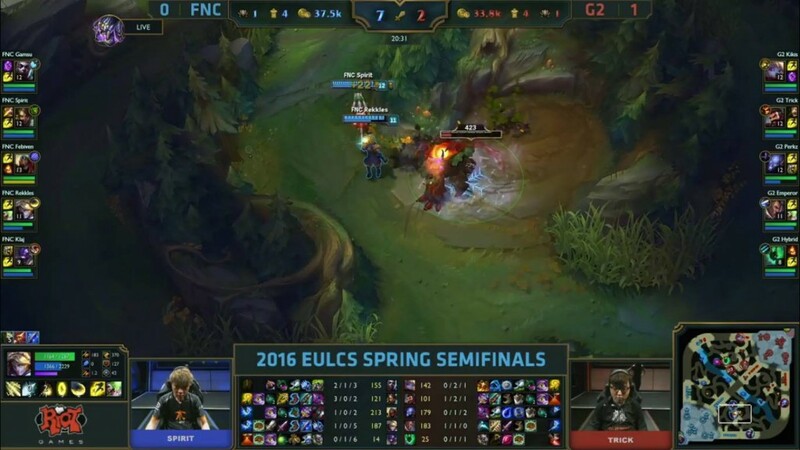 G2 continue to take down inhibs inside FNC’s base, they have to do something. They engage, and it doesn’t work out. G2 take the fight 4-2 and go on to win. Game 4 is up next. One more win for G2 will send them to finals in Rotterdam. 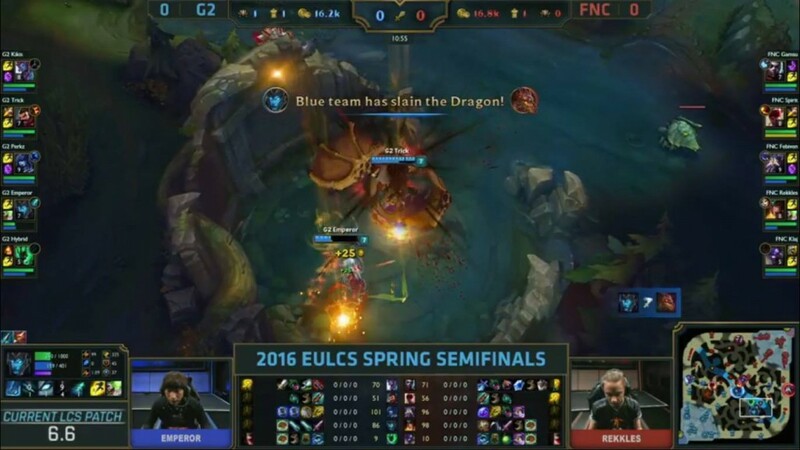 FNC need to win to avoid elimination. 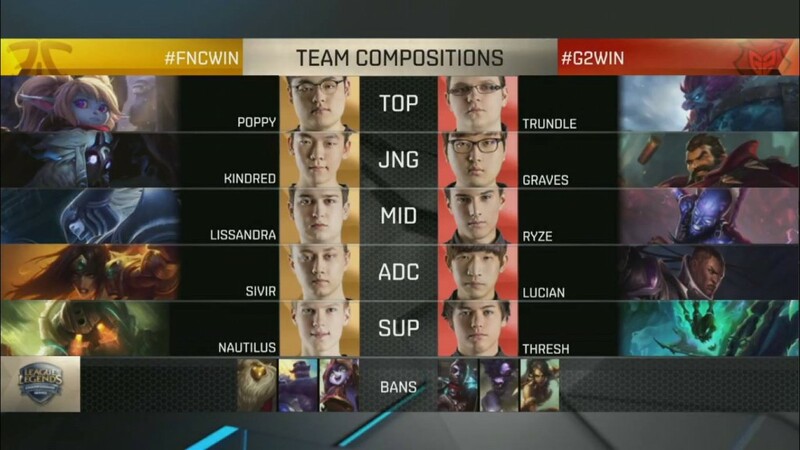 Game 4 pick and bans underway. 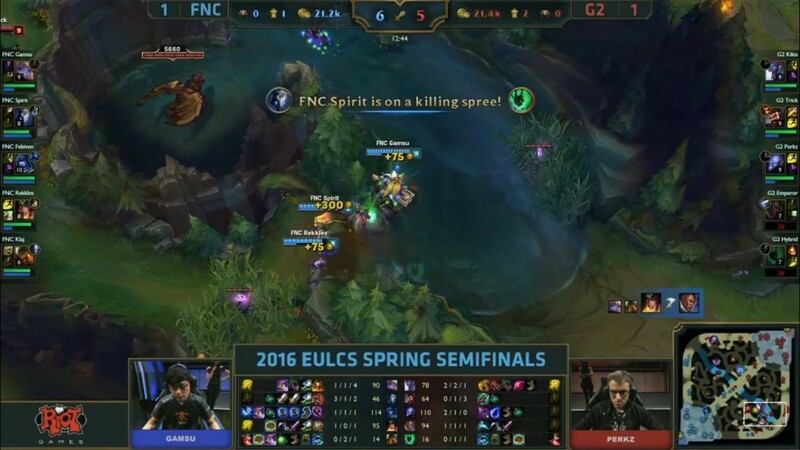 FNC ban away the Trundle and the Ekko is left open. Match point for G2. 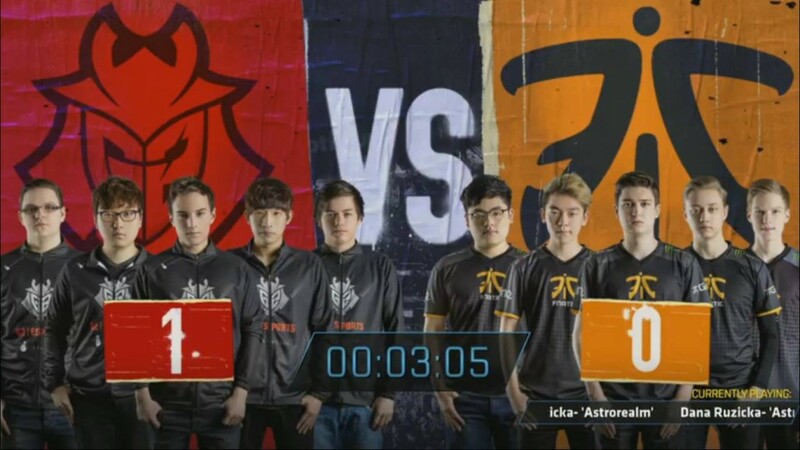 Good pick and bans by both teams. 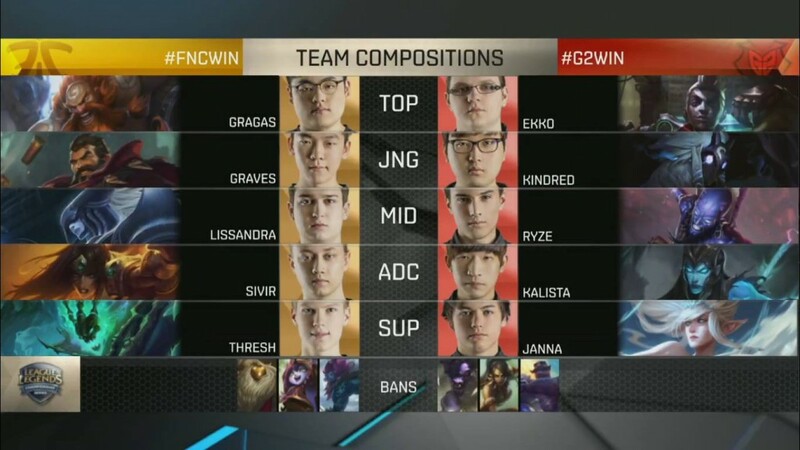 G2 will feel good get Ekko and Ryze if they can hold out till the late game. 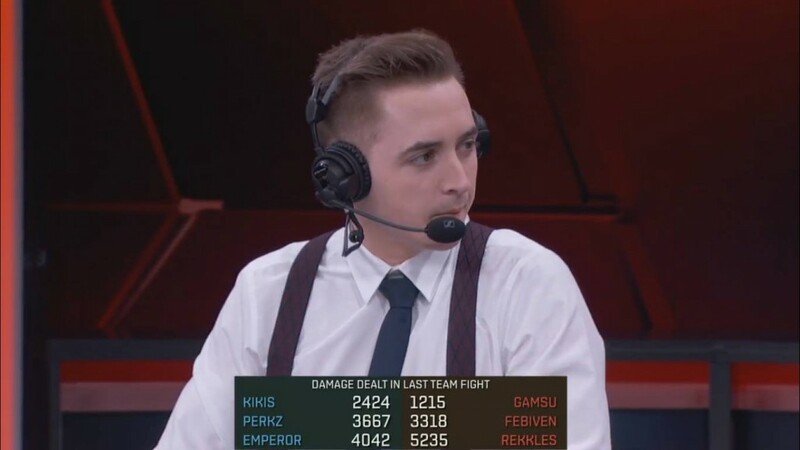 An early trade top sees Rekkles blow his heal. Perkz teleports to a minion and Febiven and Klaj catch him out. 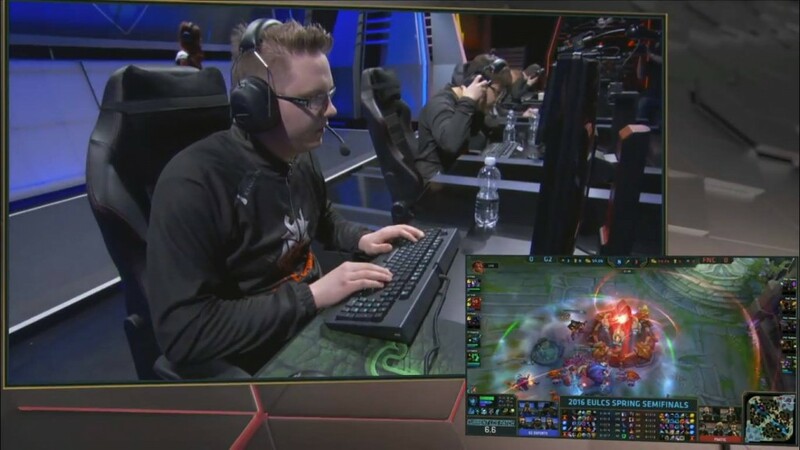 Kikis, who tried to answer with a TP, also gets caught out on the back of this. 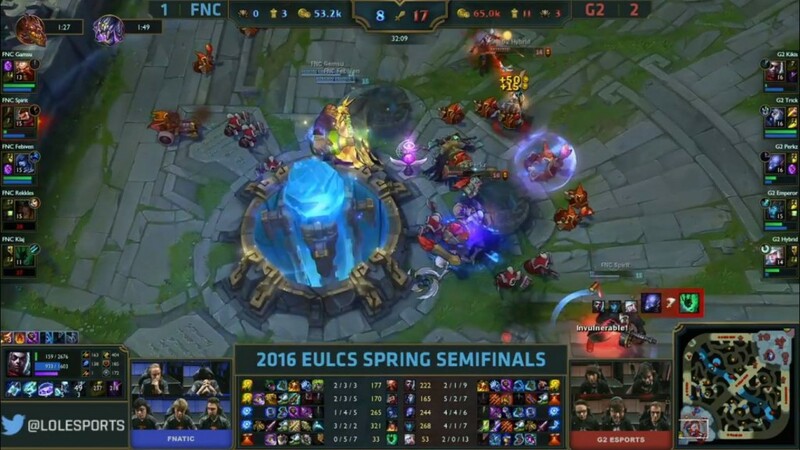 2-0 for FNC. 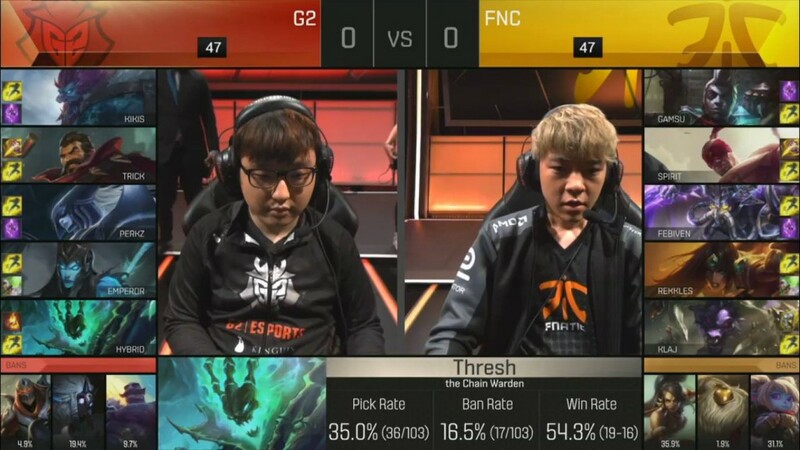 Great early start by FNC. Up in CS across all lanes too. 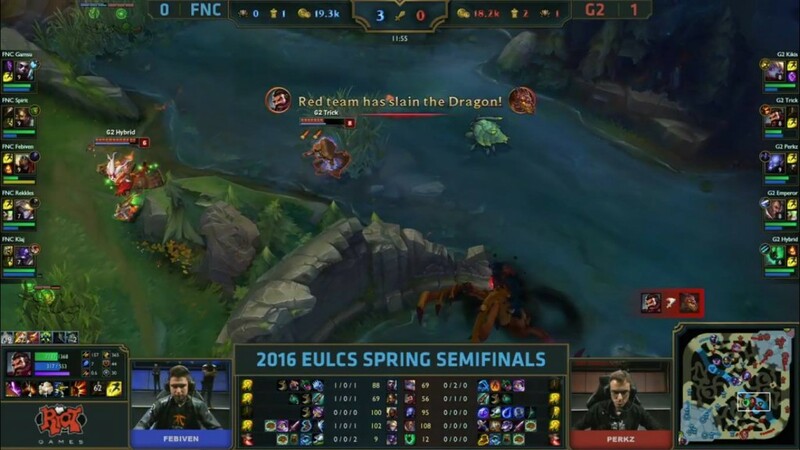 FNC perform a deep dive onto Perkz. 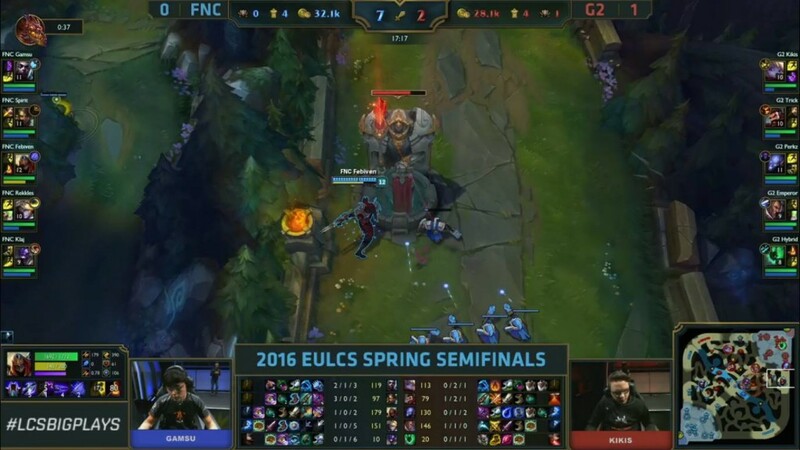 They take him down but find themselves between 2 towers and take damage – G2 collapse and take that fight 2-1. 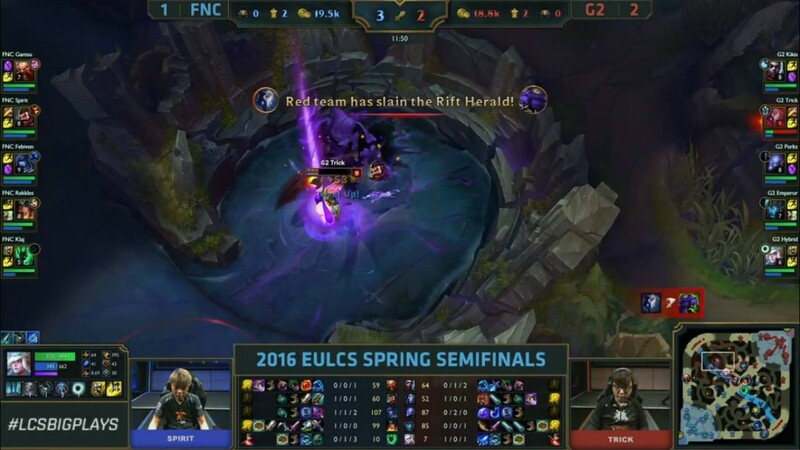 G2 pick up Rift Herald, FNC still have a gold and kill lead. 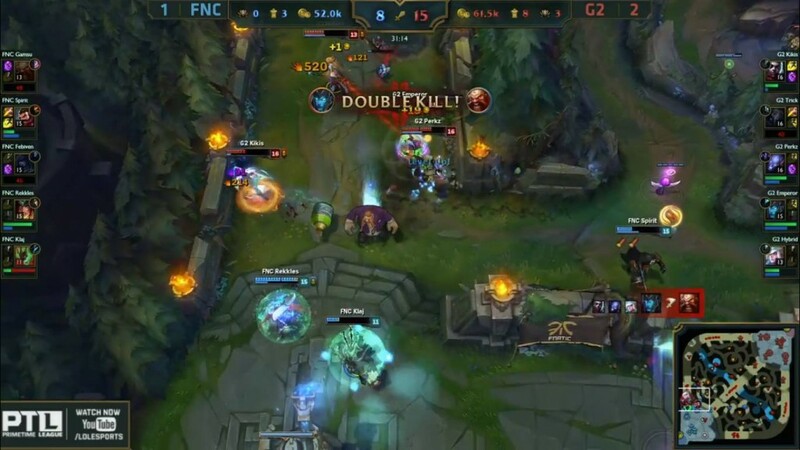 FNC think they can burst down Perkz but the teleport comes in from Kikis and G2 are able to take down Spirit and Febiven. 2-0 for G2. They take Dragon after. 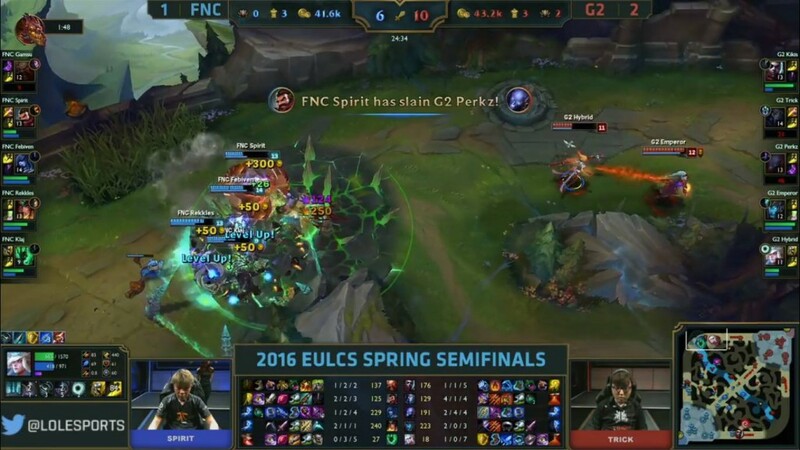 FNC catch Perkz and take him down. A fight in G2’s jungle sees G2 come out on top. They manage to pick off 2 FNC members. 20 minute update. 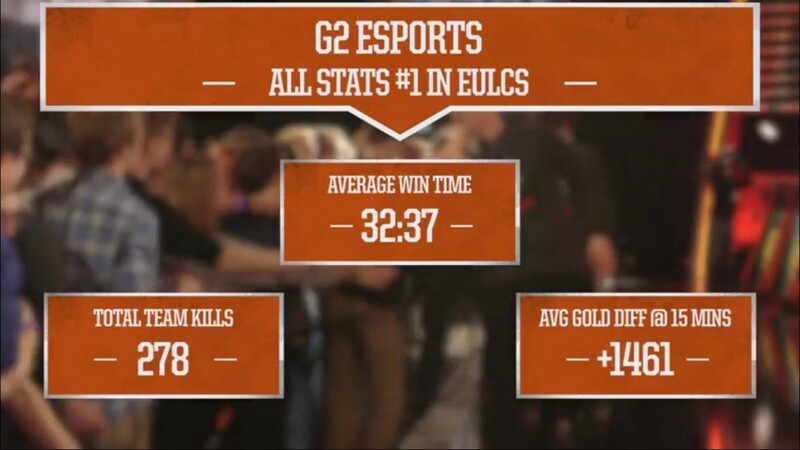 Gold is very close but G2 have been coming out on top in the last couple of team fights. 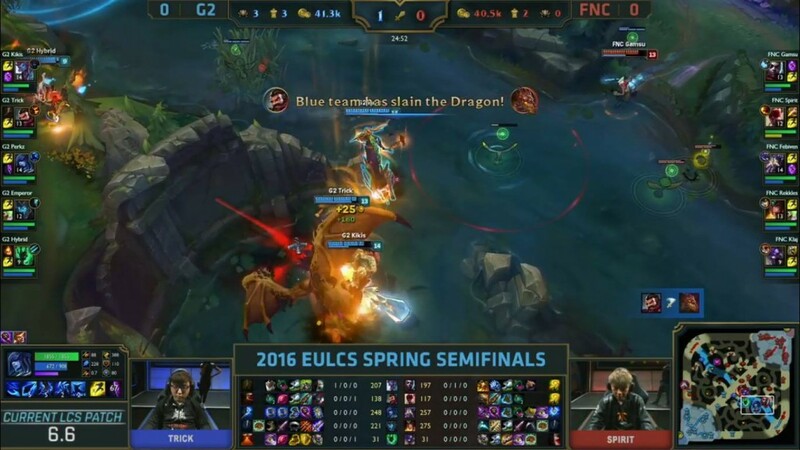 G2 pick up their 2nd dragon of the game. 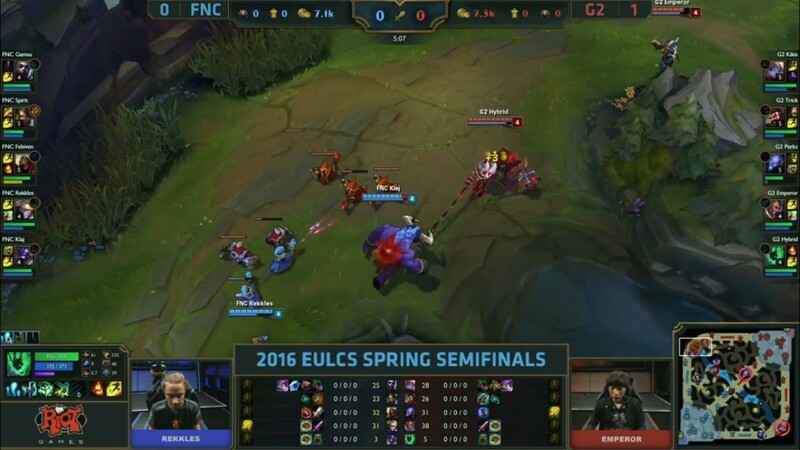 G2 start the fight as Kikis goes in, he gets low, but the monsoon and his ult are able to keep him healthy. Emperor is able to grab a kill onto Klaj and Spirit and Perks and Trick chase down Rekkles. 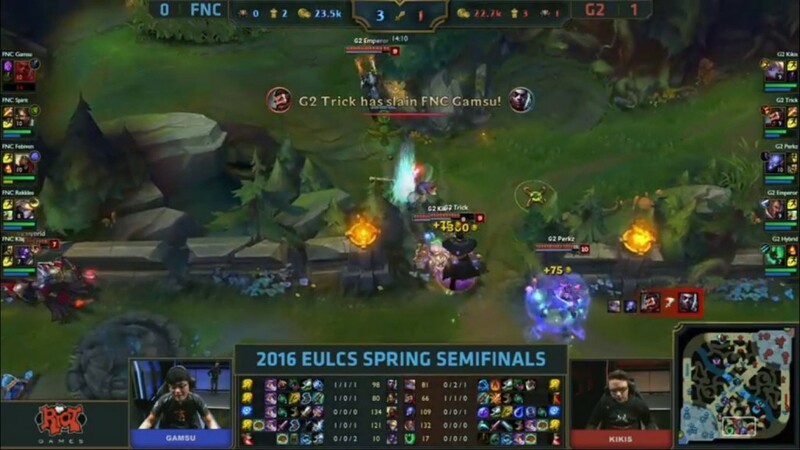 This is looking like it could be the end for FNC. 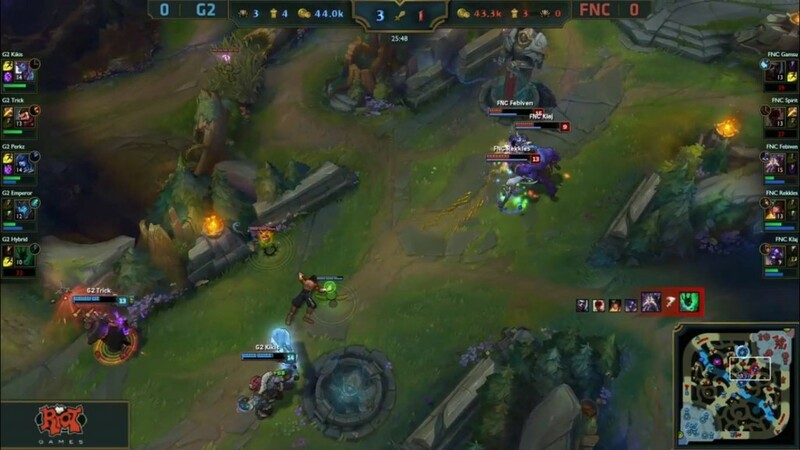 FNC are able to pick off Trick after he’s caught out of position, the rest of the team chase 3 members of G2 down and pick up a kill onto Perkz. They rotate to dragon but they get too low, they do manage to kill Emperor though who was around Baron pit trying to cut them off. 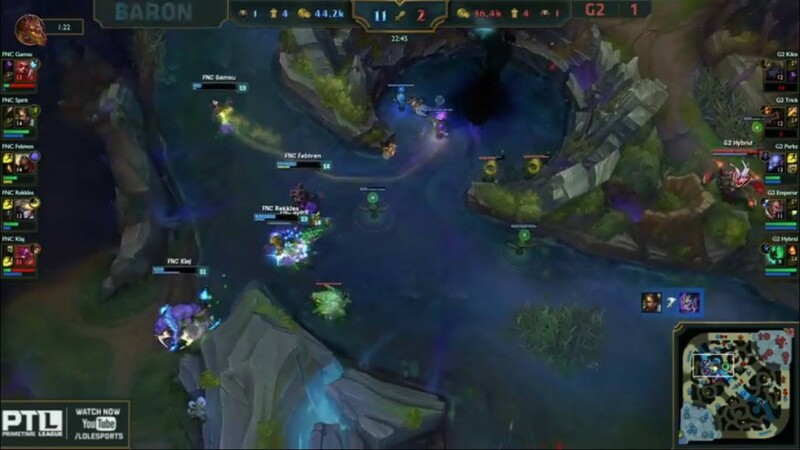 G2 get Baron. They’ll be looking to push in to win now. G2 take their first inhibitor. 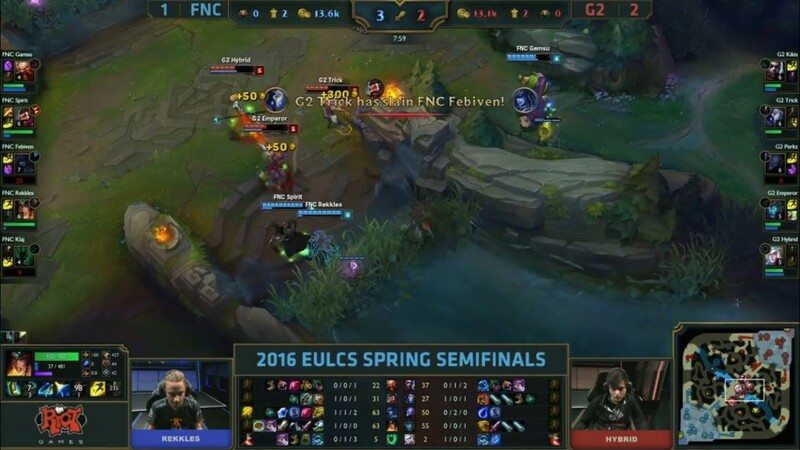 Febiven caught out overextending. No need to be that far up. 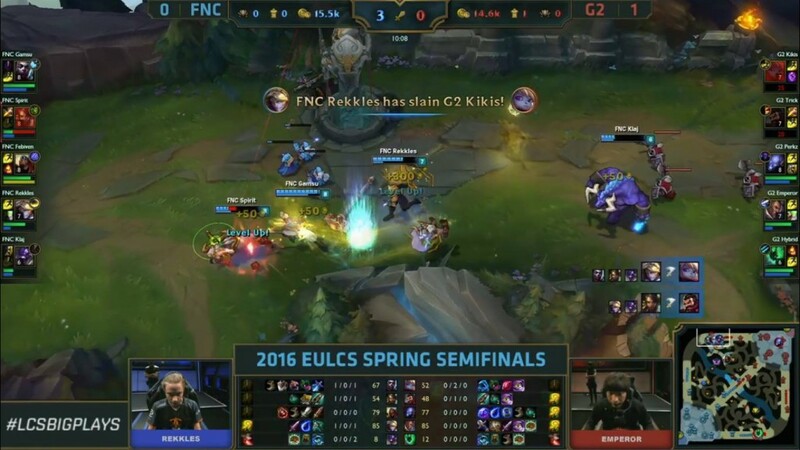 You’ve gotta question if handing over Ekko and Ryze was a good idea by FNC – they’ve proven to be amazing champions during this Spring Split Playoff. 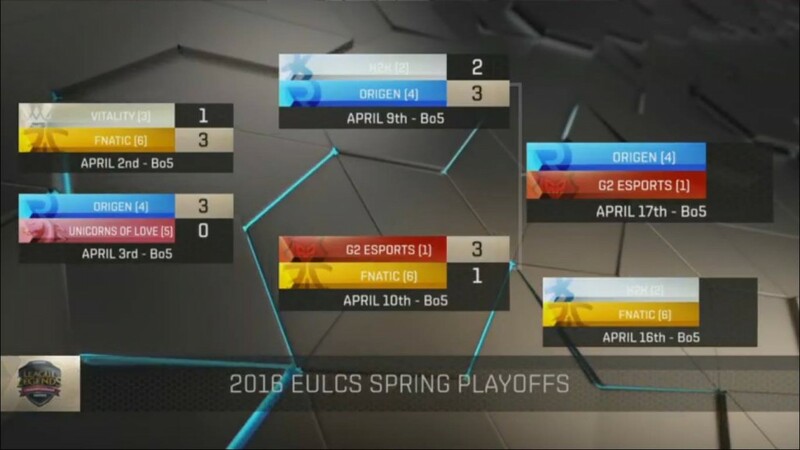 With G2 winning that game, this is how the Spring Playoff Bracket looks going into next week.